I'm sure by now you have all heard about the launch of Sublime Floss ? Well I got a surprise package of flossy treats in the mail from Sublime Stitching a couple of days ago and I couldn't wait to go and try them out! You should know that while I got the floss for free there was no obligation to write about it or whatsoever. I just wanted to share my experience using Sublime Floss with you all here. The so called 'Mingles' floss (see photo above) is a novelty in the embroidery floss world. 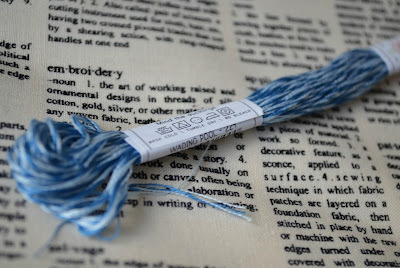 If you like to blend your threads (which I must admit rarely do) than these are pre-blended for you. So I spent a day or so stitching a cute Fennec Fox I had in my sketchbook using Sublime Floss. Now I started out with the idea of using only one palette of colours to make a simple embroidery but I ended up using colours of several of the palettes and another furry fill stitched creature. I'm very much used to choosing from a huge set of colours and shades so it was a real challenge but I think I managed quite well! Mind you this Fennec fox fella is only 1.5 inches (ears and all) high so it's quite detailed for it's size. The floss itself looks skinnier than my usual six stranded floss and felt slightly less silky but still soft to handle. It has a nice modest sheen to it. Usually before I thread a needle I run my thumb and index finger along the thread to feel which way is 'up' and should go through the eye of the needle first. I found that kind of hard with some of these threads, not sure why that is. 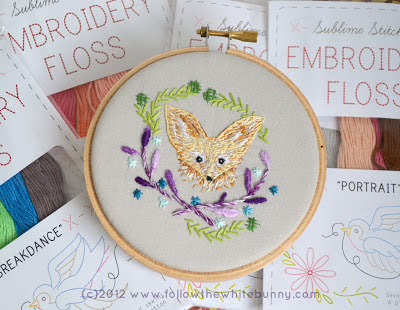 I used 1-3 strands on most bits of my Fennec Fox embroidery, except for the 'branch' which is stitched with the 'Lilac twist' from the 'Mingles' collection. From the 'Taffy Pull' collection I used various shades within the 'Blueberry' and 'Grape drink' variegated skeins to create the impression of having different shades of one colour. For the kind of very detailed stitching I have been doing lately this floss may not be the most obvious choice but I can definitely see the advantage of having ready to go, well chosen palettes with gorgeous colours for lots of other types of embroidery. The instant palettes, unique approach and attractive packaging makes the product practically irresistible. So besides treating yourself to some flossy happiness, these would be great to give to aspiring young embroiderers. Paired with some cool patterns and a hoop and needle and they are good to go. 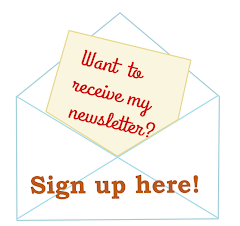 (I already saw my daughters checking out the cute packages and pretty colours!) You can even use it to make friendship bracelets (just in case the embroidery thing doesn't work out) I also would like to add that I think it's a great accomplishment for a small company like Sublime Stitching to come with their own brand of floss. Well done, Jenny! I love free stuff, especially when it is unexpected. Thanks for the honest review. I will have to check it out for myself! I've been wondering about the Sublime Floss. I love the idea of the pallets, but I'm different from many, in that I enjoy choosing colors from a wide array, to find the ones that feel just right. I imagine that these would make many more happy, than not, though. I have to tell you: the idea of that fennec being only 1.5 inches is heaven! Nicole! Your fox is incredibly beautiful!!! Thanks for the skinny on the new floss too. Thank you Nicole for the review - I was wondering about this new floss myself! Your fox is adorable too! Thanks everyone, glad you liked the review. Maybe I should do more of those?!?! The fennec fox is adorable! Please do continue doing reviews like this one...since we're on a budget reviews help me make good choices. 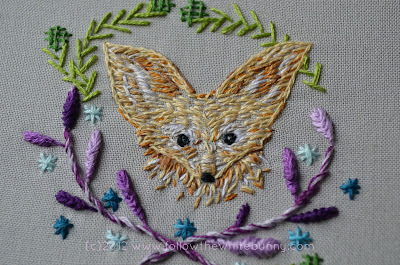 One question on the fox...what stitch/es did you use on the purple wreath? i recognize a part, but not sure...i'm new to stitching,but i love already. Thank you Virginia! For the stem/branch bit I used the stem stitch. The leaves/pods didn't work out the way I had planned. I stitched them with the Raised Herringbone Stitch because that stitch looks really lovely with variegated threads but the leaves are too small to show the different shades of purple. So next time I would probably choose a satin stitch to stitch these.